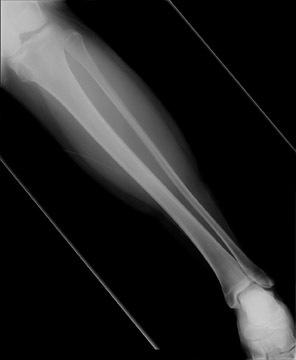 Standard radiographs of the left knee showed an expansile, lucent, cortically based, 1.5 cm metaphyseal lesion with a thin-sclerotic border in the left-proximal medial metaphyseal tibia (Figure 1). The matrix of the lesion was not well seen. Computed tomography (CT) using 2 mm cuts performed the same day revealed an expansile, cortically based lesion with a thin-cortical margin containing cartilaginous matrix (“rings and arcs”) that centered 2 cm inferior to the medial-tibial plateau measuring 2.5 × 2.4 × 1.7 cm. Of note, an area of more pronounced cortical thinning and a cortical break in its outer portion was suggestive of a pathologic fracture. There was no visualized soft-tissue component, with the surrounding soft tissues appearing normal (Figure 2). 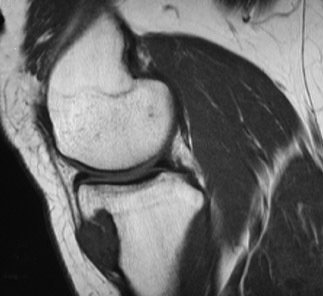 A magnetic resonance imaging (MRI) study performed the previous month (outside of our facility) showed a mildly expansile, well-defined, peripheral corticomedullary lesion in the anteromedial portion of the proximal tibial metaphysis of essentially the same measurements as obtained on the above-mentioned CT scan (Figure 3). The lesion appeared to have predominantly well-defined margins and a cartilaginous internal matrix although there were thin aggregates of calcium or bony septa throughout the internal portion. Signal intensity was low on T1-weighted imaging, mildly lower than muscle, and bright on T2-weighted imaging. Some thinning of the adjacent tibial cortex was seen and there was a tiny amount of adjacent subperiosteal fluid contiguous with the lesion. Benign-appearing, low-grade malignancy could not be excluded. ACT-guided bone biopsy was equivocal, followed by surgical resection ofthe lesion to exclude chondrosarcoma. The sample was submitted to pathology for gross, microscopic and histologic evaluation. 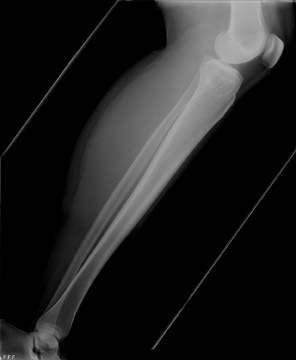 When evaluating a bone lesion, important considerations include history, the patient’s age, gender, lesion location and radiographic features. Equally important is the correlation of the radiologic and pathologic findings for the diagnosis. 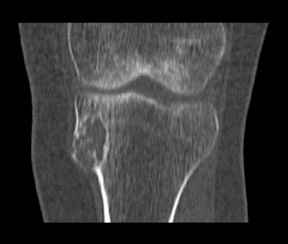 In this young, female patient with left-knee pain associated with a cartilaginous lesion of benign appearance, the relatively rare juxtacortical location, with associated cortical break, raises concern for a low-grade cartilaginous malignancy, such as a juxtacortical chondrosarcoma as opposed to the benign juxtacortical chondroma. 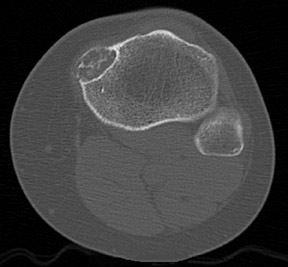 Radiographically, a juxtacortical chondroma usually appears as a small, cortically based, radiolucent oval/oblong bony defect, longer than wide with little or no calcification.1,5 Pain, swelling or both may be the presenting complaint.2 The most common location is in the hands and feet, with the metaphyseal region of long bones, particularly the humerus, involved to a lesser degree. Additionally, the lesions in the hands and feet tend to be smaller: <3 cm.2,5 The lesion does not involve the medullary space and while cortically based, the cortex maybe involved to varying degrees. 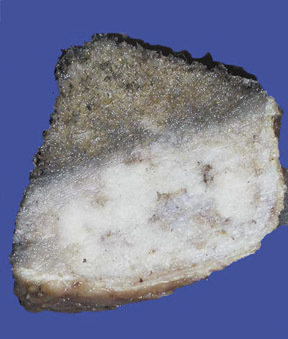 The lesion may lift the periosteum and create columns of mature periosteum at each end of the mass that appear to project out from the axis of the bone (periosteal buttress sign). Underlying bone is usually scalloped with varying degrees of sclerosis (saucerization).4 There is no stalk or peduncle, and little to no periosteal reaction. CT is utilized to evaluate the matrix for calcification and the extent of cortical involvement, which may present as cortical scalloping or a cortical shell. MRI provides additional information regarding a potential soft-tissue component and marrow edema mimicking tumor invasion. In certain cases, further cytologic evaluation is recommended to correctly identify the lesion. Low power microscopy demonstrates lobulated hyaline masses, which appear well-circumscribed, and are usually hypocellular although there may be areas of increased cellularity. While the lesion is composed of benign cartilage, the appearance is more active than an enchondroma, and may be confused with chondrosarcoma. A juxtacortical chondroma must be differentiated from a juxtacortical (or periosteal) chondrosarcoma, particularly as a juxtacortical chondroma often demonstrates high cellularity, binucleated cells, hyperchromatism and a myxoid appearance.2,4,5 Radiographic correlation is often helpful to discern the more benign appearance of the juxtacortical chondroma with its thin-endosteal border of sclerosis.5 Patients with a juxtacortical chondrosarcoma are usually older than those with a juxtacortical chondroma. The chondrosarcomas are usually larger with a soft-tissue component. Histologically, these tumors usually demonstrate definitive anaplasia, although sometimes the distinction between aperiosteal chondroma and low-grade chondrosarcoma is difficult or indeterminate.1,5 If the patient is older, the lesion has an aggressive radiologic pattern with cortical destruction, or if there is evidence of soft-tissue invasion on macroscopic or microscopic examination, a diagnosis of chondrosarcoma should be considered. Treatment is currently surgical resection with wide marginal excision including underlying cortex, without capsular disruption, to prevent recurrence. There is little chance of recurrence after enbloc excision, although local recurrence can occur with incomplete excision, or if the lesion is a chondrosarcoma.1,3,4 Radiation therapy or chemotherapy is not indicated. A juxtacortical chondroma is a relatively rare, benign bone tumor, occurring in the hands and feet most commonly as well as the metaphyseal region of long bones, most often in the proximal humerus. The tumor most frequently occurs in young adults, with patients presenting in their 20s to 40s. While the appearance radiographically is characteristic, differentiation from the more aggressive chondrosarcoma can, at times, be confusing, particularly when the lesion demonstrates a soft tissue component, or a more aggressive histologic appearance. Histologic evaluation combined with the radiographic findings can lead to the correct diagnosis, but without awareness and consideration of this uncommon, but benign tumor, more extensive or even severe treatment may ensue. Boriani S, Bacchini P, Bertoni F, Campanacci M. Periosteal chondroma. A review of twenty cases. J Bone Joint Surg Am. 1983;65:205-212. Nojima T, Unni KK, McLeod RA, Pritchard DJ. 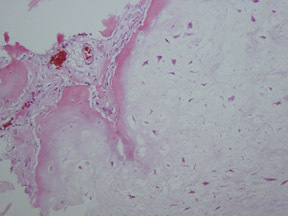 Periosteal chondroma and periosteal chondrosarcoma. Am J Surg Pathol.1985;l9:666-677. Fornasier VL, McGonigal D. Periosteal chondroma. Clin Orthop Relat Res. 1977;124:233-236.
de Santos LA, Spjut HJ. Periosteal chondroma: A radiographic spectrum. Skel Radiol. 1981;6:15-20. Brien EW, Mirra JM, Luck JV Jr. Benign and malignant cartilage tumors of bone and joint: Their anatomic and theoretical basis with an emphasis on radiology, pathology andclinical biology. 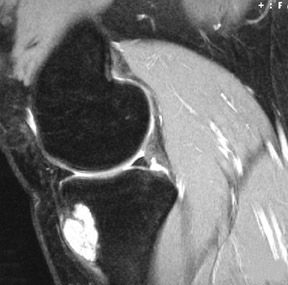 II, Juxtacortical cartilage tumors. Skeletal Radiol. 1999; 28:1-20. Juxtacortical chondroma of the left-proximal medial metaphyseal tibia. Appl Radiol.